Call of Duty games are notoriously difficult to review, with recent yearly updates for the big console versions feeling more like massive DLC packs for the incredible, original Modern Warfare. The problem many critics have is that the core Call of Duty nuts and bolts are of a damn fine game, disguising the updates that have started to feel like worse value than any yearly FIFA or PGA Tour game. Luckily for you, I don’t have that problem. This latest mobile Call of Duty game is a sequel to the previous COD: Zombies title, which was based on the Zombies mode from World at War. This one is based on last years Black Ops game, and takes the Zombies mode of that title and brings it to the iPhone. For those of you that are unaware of the Zombies mode, it is essentially a survival game where you and a team of friends must defend a building against a horde of Nazi flesh-eating undead that smash through windows and doors in an attempt to eat your face. 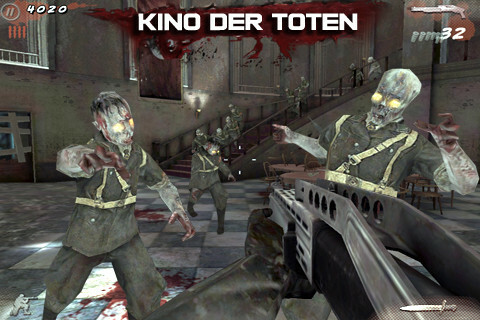 The mode has always been popular, combining standard Call of Duty gameplay and weapons with the twist of zombies, adding a big sense of variety to the console versions. This version has some nice extras over the first iPhone game, with zombie dogs and gas-filled zombies adding to the tension. The game is playable online with full coop, over Game Center and it is still just as intense to play as it ever was. This new edition even adds in voice chat, a great addition that brings some life to the online play. It is stressful fun. The map is extremely well designed, so no complaints there as you will easily find an hour or two of play from this one level. Yes, you read that correctly, one map. For your premium price of £4.99/$6.99 you get one map to play in. I’m sorry but that is totally unacceptable, any way you look at it. Yes, the map you get is excellent, with a big array of options, but to charge so much and only give players a single level to blast zombies in is nothing short of an insult. Adding selectable characters does not fill the void. If the game was under a dollar I would still criticise the decision, but to charge seven dollars is outrageous. I would have expected six or seven maps at least for that price, and the fact that this only includes one of the two maps from the console original is baffling. Why could the effort not have been made to create a full Call of Duty game for iPhone gamers? Only Activision know the answer to that, as it has been nearly two years since the first zombies game on iOS. It is especially galling when you consider Gameloft’s stellar work with FPS games on iOS, where they manage to create full single player and online coop campaigns with complete competitive options. Look at Modern Combat or Rainbow Six, both offer far more for a lot less cash. Activision have included a hidden bonus game, Dead Arcade, a twin stick shooter. It would add value if it wasn’t so gut churningly slow and awkward. It is one hidden game that I wish had stayed hidden. The gameplay, graphics and sound on display here are all excellent, as is the presentation. In all these aspects the game is a success, and feels like a premium shooter. 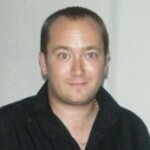 Playing online is brilliant fun, and the new zombies and voice coms are welcome changes. If this had a few more maps the score below would have been closer to 80%, but to charge so much for so little? It might make you want to go on your own undead rampage. Yes I agree to an extent, but I have to compare the value with other FPS mobile games that launched at a similar price. It is a good game and plays very well and online coop is great, but the price-content ratio is terrible compared to say, nova 2 or others.